Having a clear yard is one of the best ways to improve the curb appeal of your DuPont house. The first thing an individual sees about a home is its exterior. Proper tree stump removal is necessary if you want to make your home the best looking in all of DuPont. Hunter’s Tree Service provides you with the best in stump removal and stump grinding services so that you do not need to worry about the appearance of your landscape. These tree removal services are quite vital as they remove dead and rotting trees or even stumps that are spoiling the appearance of your yard. With healthy trees in your yard, the overall appearance of the yard improves. With a wide range of tree removal services and tree care, we ensure that the beauty of your DuPont yard is maintained. If you desire to have the best looking yard in town, then all these services will help you in ensuring it happens. Stump removal is quite a necessary procedure but is constantly overlooked by DuPont homeowners. They often are of the belief that the stump is not harming anybody by just being there, but stump removal or stump grinding is important to protect other trees and even the structure of your home. Our tree removal services will provide you with the very best in stump removal or stump grinding, which is guaranteed by their extensive experience in tree stump removal. This will improve the aesthetic appearance of your home and also make it safe for living. Rotting trees are a great safety hazard and can cause damage to your home in DuPont. Hiring an expert tree removal service will allow you to take care of the stump grinding safely. 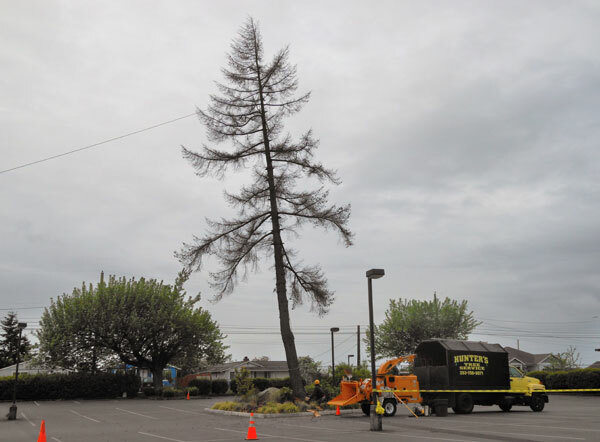 Doing such work can be quite dangerous but Hunter’s Tree Service puts safety first in any stump removal or stump grinding project, both for the residents and the workers as well. Bringing down trees should not be carried out by inexperienced people as they could end up getting hurt. Therefore, call us today for experienced tree removal services that are designed to solve your problems and to remove any eyesore in your yard. We even provide emergency services as a result of storms as they need immediate attention to prevent further damage. So pick up your phone and give us a call today.